Developed in parallel with Optoma's "Full 3D" video projectors, the ZF2300 system is optimized to provide higher contrast & brighter images than ever before. Using RF (radio frequency) technology, the ZF2300 system is easy to install in the same room as the projector and eliminates line-of-site issues commonly found with IR based 3D glasses systems. Compatible with all Optoma projectors with 3D VESA port. What's in the Box: ZF2300 glasses, soft carry case, cleaning cloth, USB charging cable, 2x nose piece. Rechargeable Battery: Lithium Polymer - up to 25 hours use! View More In 3D Glasses. If you have any questions about this product by Optoma, contact us by completing and submitting the form below. If you are looking for a specif part number, please include it with your message. 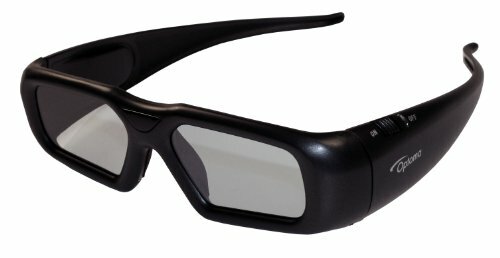 DLP LINK 144 Hz Ultra-Clear HD 2 PACK 3D Active Rechargeable Shutter Glasses for All 3D DLP Projectors - BenQ, Optoma, Dell, Mitsubishi, Samsung, Acer, Vivitek, NEC, Sharp, ViewSonic & Endless Others!